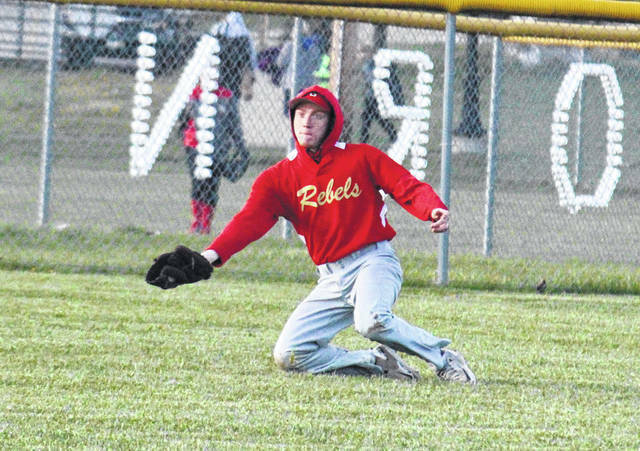 South Gallia senior Wade Luther makes a diving catch in left field during the Rebels’ 15-0 loss to Southern on April 19 in Racine, Ohio. The high school postseason is just around the corner, but the roads to the district tournament were paved Sunday afternoon as the 2018 OHSAA Southeast District baseball tournaments were officially released in all four divisions. Half of the six area programs need only one win to get out of sectional play, while Meigs, River Valley and South Gallia each need at least two victories to advance to their respective district tournaments. Starting in Division IV, top-seeded Eastern earned the area’s highest overall placement and will host the winner of the 8-9 matchup between Federal Hocking and South Webster in a sectional final at 5 p.m. Tuesday, May 8. Fourth-seeded Southern will host fifth-seeded Belpre in a sectional final contest at Star Mill Park at 5 p.m. Tuesday, May 8. South Gallia came away with the 11th-seed and will travel to sixth-seeded Trimble for a D-4 sectional semifinal contest at 11 a.m. Saturday, May 5. The winner advanced to face third-seeded Pike Eastern in the sectional final at 5 p.m. Tuesday, May 8. Division IV district tournament play will be held at the VA Memorial Stadium in Chillicothe starting May 14. Meigs drew a six-seed in Division III and will host 11th-seeded Southeastern in a sectional semifinal at 5 p.m. Wednesday, May 9. The winner will travel to third-seeded South Point for a sectional final contest at 11 a.m. Saturday, May 12. River Valley received the 13th-seed and will travel to fourth-seeded Crooksville for a sectional semifinal at 5 p.m. Wednesday, May 9. The winner hosts the winner of the 5-12 matchup between Wellston and Fairland in a sectional final at 11 a.m. Saturday, May 12. Division III district tournament play will be held at the VA Memorial Stadium in Chillicothe starting May 17. Gallia Academy — the lone Division II program in the Ohio Valley Publishing area — came away with a six-seed and will travel to third-seeded Marietta for a sectional final at 5 p.m. Thursday, May 10. Division II district tournament play will be held at Ohio University and Athens High School starting May 14. Visit seodab.org for complete pairings and brackets of the 2018 OHSAA Southeast District baseball tournament.